How often should you use mandelic acid? Does mandelic acid have any side effects? Mandelic acid is used as a gentle chemical peel on sensitive skin and darker skin tones. Professional and at-home product options come in different strengths. Caution is advised when using chemical peels with higher acid concentrations. When it comes to facial care, supporting and nourishing the skin’s natural chemical balance is key to staving off the signs of aging. Mandelic acid, a natural chemical peeling agent, is used to accelerate cell turnover. This helps reduce the appearance of fine lines, dark patches, acne blemishes, and other common skin concerns. Here’s what you need to know about this versatile facial rejuvenation treatment and the wide range of product options to choose from. Mandelic acid is a type of alpha hydroxy acid that’s extracted from bitter almonds. Alpha hydroxy acids are also found in other types of food, such as citrus fruits, grapes, and tomato juice. These natural exfoliating agents come in different strengths and produce varied effects when applied to the skin. Mandelic acid acts as a powerful — yet gentle — exfoliator that breaks up the tiny bonds between dead cells at the skin’s surface, making it an effective component in chemical peels. Compared to chemical peels containing salicylic, glycolic or lactic acids, mandelic acid is lower in strength but produces longer-lasting effects. Mandelic acid’s gentle peeling effect can be attributed to its molecular structure. Since its molecules are larger than those found in glycolic acid and other alpha hydroxy acids, mandelic acid takes longer to penetrate the skin’s surface. This makes it less likely to cause irritation. Professional and at-home mandelic acid formulas come in different strengths. Higher strength concentrations — such as 40% or greater — should only be applied by a dermatologist or qualified provider. Treatments can be scheduled every other week or possibly on a weekly basis, depending on healing time. At-home peel products typically have a 20–25% percent concentration. They can generally be applied several times a week, depending on how well your skin tolerates them. Skin should be fully healed before applying another peel. People whose skin is prone to cold sores may want to have a dermatologist perform the peel, since it can trigger outbreaks; your dermatologist can prescribe antiviral medications to prevent this. As with any chemical peeling agent, mandelic acid peels can cause side effects, but taking certain precautions will greatly minimize these risks. While this type of treatment mainly interacts with surface layer skin cells, it does stimulate tissue remodeling and collagen fiber production. People with darker complexions or sensitive skin are therefore at higher risk of discoloration and scarring, two side effects that are common to all chemical peels. Immediately after applying mandelic acid, the skin will feel sensitive. It may also become dry, a little flaky and take on a pinkish color. It typically takes two to three days for the skin to fully heal. During this time, it’s especially important to avoid sun exposure, scrubs, and strong cleaning agents. Using a sunscreen with an SPF of 30 or higher is recommended. Using mandelic acid as an acne treatment may also result in purging, as clogged pores underneath the skin rise to the surface. In most cases, these pimples will go away within two or three days. If you’re interested in trying mandelic acid at home, consider these products, but always check ingredient labels for any substances you might be allergic or sensitive to. Its formula contains antioxidant ingredients to neutralize the free radicals that damage skin cells, while its exfoliant effects help rid the skin of blackheads and acne-causing bacteria. Cellbone Mandelic Acid Peel Serum is a gel that combines a 25% mandelic acid concentration with menthol and cucumber flower extract to soothe and refresh the skin. This at-home product exfoliates dead skin cells and stimulates the growth of new cells. Continued use improves the skin’s elasticity and hydration, giving it a smoother, more even appearance. With an acid concentration of 15%, Tucker Ashley M15 Mandelic Acid Serum offers a gentle peel effect that’s not too strong for sensitive skin types. Its natural anti-inflammatory and antifungal properties make it an ideal choice for reducing acne and evening skin tone. It can be used on areas of the body with thicker skin, such as the back, thighs, chest, and buttocks. This serum also moisturizes skin while exfoliating debris from clogged pores. In the process, its effects can help expel ingrown hairs and soothe inflamed hair follicles. 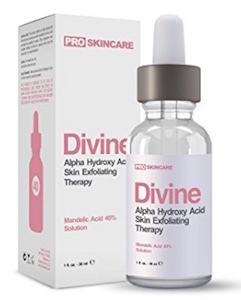 Divine Derriere Mandelic Acid Peel 40% is another high concentration at-home chemical peel that should only be used once skin can tolerate products with a 25% concentration. As a peeling agent, it absorbs into the deeper layers of the skin to act as a resurfacing treatment. As one of the strongest over-the-counter chemical peels, 40% Mandelic Acid Peel from Makeup Artist’s Choice isn’t a beginner’s peel. It should only be used in instances where the skin has tolerated applications of a 20–30% mandelic acid concentration. It produces rapid results by exfoliating dead skin cells and clearing the pores of oily buildup. While mandelic acid peels can work wonders for the complexion, over-exfoliating can have the opposite effect by causing actual damage to the skin. All in all, if you’re looking for a natural solution that reduces signs of aging and works well with sensitive skin, mandelic acid fits the bill. Considering the range of products available, it’s best to start with lower concentration formulas to see how your skin responds. » For more information on mandelic acid and other chemical peels, schedule an appointment with a cosmetic doctor by using Zwivel’s free online consultation tool.